Lauren and Jackson sit under our Thankful Tree with the shoeboxes they packed for Operation Christmas Child. What if we could send Jesus’ love directly to a child on the other side of the world who desperately needs to know God is real and He deeply cares for them? What if through one simple gift, we could be a part in introducing a young person to the life-changing Gospel? Missions is personal, just like God’s grace. When God gave us the Great Commission, He didn’t intend for us to just give money and let other people do the work. God wants us to get our hands dirty, to be directly involved in sharing His message of hope with people all over the globe who Jesus died on the cross to save. That’s why my family has wholeheartedly taken on the ministry of Operation Christmas Child. The world’s largest Christmas project of its kind, Operation Christmas Child, uses gift-filled shoeboxes to demonstrate God’s love in a tangible way to children in need around the world. Since 1993, Operation Christmas Child has delivered gift-filled shoeboxes to more than 124 million children affected by war, poverty, natural disasters, and other crises in more than 150 countries and territories. They then partner with local churches to share the Good News of Jesus Christ with those who receive shoebox gifts and help them understand what it means to follow the Lord and share their faith with others. This nondenominational ministry is part of Samaritan’s Purse, led by Franklin Graham. For more on this amazing mission endeavor, visit www.samaritanspurse.com/occ. I remember packing shoeboxes when I was a kid with my family, but as an adult, I didn’t continue my participation in the ministry. 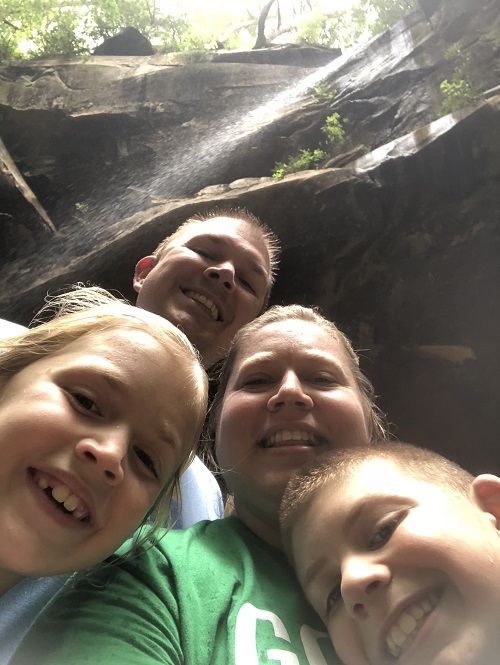 I had been praying this fall about how my husband and I could do missions with our kids, when God arranged for me to reconnect with an amazing woman of God who really mentored me in ministry when Matt and I were first married. She is a regional coordinator for Operation Christmas Child (OCC), and invited me to revisit OCC’s vision. My heart beats for evangelism and international missions, and God swung the door open wide for me to join in and be a part of impacting children around the world. God brought together an amazing team from my church to serve alongside, and our church has refreshed our involvement in OCC and is a drop-off location for shoeboxes in our community, the first here in our town! When I was reviewing promotional videos for OCC at home trying to decide which ones to show at church, my son Jackson began to watch with me. At one point, I turned around to see if he was still interested, and he was crying. God had touched his heart with the thought that our shoebox gifts could introduce these children to Jesus, and how the gifts could make a difference in their lives. He bought into the vision. Lauren loved shopping for the gifts to fill our shoeboxes. She went with me several times to pick up items, and thought about what they would mean to the child who would receive them. In fact, over the course of the last few months as I have been involved in the organizational planning for OCC locally, she shared her excitement with her teacher at school, and her Kindergarten class is packing two special boxes. I love this ministry because our family can be hands-on with missions. We can know our boxes will impact lives. That children somewhere else in the world, perhaps hurting, hungry, alone and in difficult situations, will know that there is a family out there who loves them and wanted to share a shoebox full of gifts with them. And if someone loved them enough to do that, maybe, just maybe, there is a God out there who loves them, too. Operation Christmas Child is praying for 11 million boxes to send to children in need around the world in 2015. This morning, my church family came together and brought our boxes forward to dedicate them and pray over them. I just wanted to cry out in praise to see people of all ages, from young to old, bring their gifts to the altar asking God to use these boxes and to use them personally to bring God glory. Each box represents a life that we pray will be impacted for eternity. National Collection Week for Operation Christmas Child shoeboxes is Nov. 16-23. It’s not too late to pack a box and drop it off at collection centers around the country (find one closest to you)!! You can also go online and build a shoebox – an easy way to be a part of this ministry. We can bring good news and great joy to children around the world. As we join in the ministry of Operation Christmas Child, we are sending the love of Jesus wrapped up in a shoebox to a child who needs to experience Him. How often do you pray? How do you pray? Prayer is essential in our growing relationship with God. It connects us intimately with our Savior, and is where we receive power and guidance to have victory in our lives and fight for breakthrough in the lives of those we love. Yet, when I consider those two questions, I know the answers are not what they should be. Can you relate? After the recent movie War Room came out, star Priscilla Shirer released a book called Fervent, a Woman’s Battle Plan for Serious, Specific, and Strategic Prayer. If you need motivation, inspiration and an action plan to get serious about your prayer life, this book is for you, just like it was for me. I needed a good kick in the pants to consider why my prayer life needed revival and how I could be more strategic and committed to praying for those I love and for my own freedom and victory over sin and Satan’s subtle attacks. Shirer has written this book with a very personal, conversational style. You will feel as if she really is sitting next to you, talking with and encouraging you. That’s a good thing, because challenge and conviction is much better received coming from a dear friend who cares about you. And, trust me that you will feel both, in the best of ways, when working through Fervent. Attacks on our passion: Have you ever felt like you’ve lost your cutting edge? That your faith has grown lackluster and you don’t even know why? Jesus can and will restore you. Attacks on our focus: It’s easy to lose sight of the real enemy we are fighting against. We must focus the battle on the enemy rather than those around us. Attacks on our identity: We must see ourselves the way God sees us and not fall for Satan’s lies. Attacks on our confidence: Satan loves to keep us battling in the past, and allowing what happened in our past to defeat us now. We must not fall for this. Attacks on our calling: Satan uses fear to stops us from living in the center of God’s calling. Prayer helps us confidently step out in faith, and push aside the fear that can cripple. Attacks on our rest and contentment: If you are feeling pressure to live up to everyone else’s expectations or fill your calendar to the brink, it could very well be Satan’s tactic to keep you exhausted and ineffective. Attacks on our heart: Forgiveness is essential in living in God’s grace and power. Prayer helps us stay close to God’s heart. Fervent was truly an inspiring read, that made me want to buckle down and commit to regular and focused time in prayer with God. I must be intentional in prayer, and each chapter gave specific Scriptures to claim in my prayer strategy. There were only two aspects of the book that left me wanting more. First, Shirer uses her pages to focus mostly on the strategy of prayer and the battle grounds we face. While that is a worthy endeavor, for me there also needs to be a balance of the specific strategies with simply having a conversation and pouring out my heart to God. Sometimes just being with God is what I need most. Secondly, I was hoping for concrete examples and more of a “step-by-step” guide to creating prayer strategies. Perhaps Shirer chose not to include them, because that is a worthy exercise we need to work through on our own rather than copying someone elses. Overall, Fervent is an eye-opening, challenging and life-changing book that I definitely recommend to you. It’s one to keep as a resource and come back to again and again. That’s why I’m so pleased to offer you the chance to win a free copy of Fervent! Fill out this simple form, and one winner will be chosen randomly on Friday, Nov. 12. For more on the book and to purchase for yourself, or for a woman of God you know would benefit or enjoy learning more on prayer, click here.